GDP (or Gross Domestic Product) and GNP (Gross National Product) measure the size and strength of an economy but are calculated and used in different ways. An estimated value of the total worth of a country’s production and services, within its boundary, by its nationals and foreigners, calculated over the course on one year. An estimated value of the total worth of production and services, by citizens of a country, on its land or on foreign land, calculated over the course on one year. GDP = consumption + investment + (government spending) + (exports − imports). GNP = GDP + NR (Net income inflow from assets abroad or Net Income Receipts) - NP (Net payment outflow to foreign assets). Business, Economic Forecasting. Business, Economic Forecasting. To see the strength of a country’s local economy. To see how the nationals of a country are doing economically. Total value of products & Services produced within the territorial boundary of a country. Total value of Goods and Services produced by all nationals of a country (whether within or outside the country). USA ($17.42 Trillion in 2014). USA (~ $11.5 Trillion in 2005). GDP stands for Gross Domestic Product, the total worth estimated in currency values of a nation’s production in a given year, including service sector, research, and development. That translates to a sum of all industrial production, work, sales, business and service sector activity in the country. Usually this is calculated over a period of one year, but there may be analysis of short and long term trends to be used for economic forecast. Gross Domestic Product can also be calculated on a per capita (or per person) basis to give a relative example of the economic development of nations. GNP stands for Gross National Product. In general terms, GNP means the total of all business production and service sector industry in a country plus its gain on overseas investment. In some cases GNP will also be calculated by subtracting the capital gains of foreign nationals or companies earned domestically. Through GNP an accurate portrait of a nation’s yearly economy can be analyzed and studied for trends since GNP calculates the total income of all the nationals of a country. This gives a far more realistic picture than the income of foreign nationals in the country as it is more reliable and permanent in nature. Gross National Product can also be calculated on a per capita basis to demonstrate the consumer buying power of an individual from a particular country, and an estimate of average wealth, wages, and ownership distribution in a society. Here is a video of economist Phil Holden explaining the difference between GNP and GDP and talking about how they are measured and how accurate they are. GDP of a country is defined as the total market value of all final goods and services produced within a country in a given period of time (usually a calendar year). It is also considered the sum of value added at every stage of production (the intermediate stages) of all final goods and services produced within a country in a given period of time. There are various ways of calculating GNP numbers. The expenditure approach determines aggregate demand, or Gross National Expenditure, by summing consumption, investment, government expenditure and net exports. The income approach and the closely related output approach sum wages, rents,interest, profits, non income charges, and net foreign factor income earned. The three methods yield the same result because total expenditures on goods and services (GNE) is equal to the value of goods and services produced (GNP) which is equal to the total income paid to the factors that produced the goods and services (GNI). Expenditure Approach to calculating GNP:GNP = GDP + NR (Net income from assets abroad (Net Income Receipts)). GDP and GNP figures are both calculated on a per capita basis to give a portrait of a country's economic development. GDP (or Gross Domestic Product) may be compared directly with GNP (or Gross National Product), to see the relationship between a country's export business and local economy. A region's GDP is one of the ways of measuring the size of its local economy whereas the GNP measures the overall economic strength of a country. These figures can also be used to analyze the distribution of wealth throughout a society, or the average purchasing power of an individual in the country etc. Increase in exports of a country will lead to increase in both GDP and GNP of the country. Correspondingly, increase in imports will decrease GDP and GNP. However, sometimes increase in exports might only lead to increase in GDP and not GNP. The exact relationship will depend on the nationality status of the company doing the export or import. E.g. if Microsoft Corporation has a 100% owned subsidiary in India, and that office exports US$2 Billion worth of services out of India, then US$2 Billion will be added to the GDP of India. However, it will not be added to the GNP figure since the export is done by a US company and not an Indian company. GDP is perhaps the most widely used metric to measure the health of economies. But some economists have argued that GDP is a flawed metric because it does not measure the economic well being of society. For example, it's possible that GDP is going up but median income going down and poverty rate increasing. GDP also does not measure environmental impact of growth, nor sustainability. Other important metrics include health of the population, infant mortality rates, and malnutrition rates, none of which are captured by GDP. Stiglitz says that around 1990, GDP supplanted GNP as the primary measure of economic progress. He says that GNP measures the income of the people within the country whereas GDP measures economic activity in the country. If economic activity occurs in the country but the income from this activity accrues to foreigners, it will still be counted in GDP but not in GNP. He cites the example of privatized mining. Often the state gets a royalty of 1-2% but the income from privatized, foreign-owned mines accrues largely to shareholders. (Also see Stiglitz's article: GDP Fetishism). The Social Progress Index was designed to measure non-economic indicators of well-being such as literacy rates, child mortality rates, shelter, access to water etc. 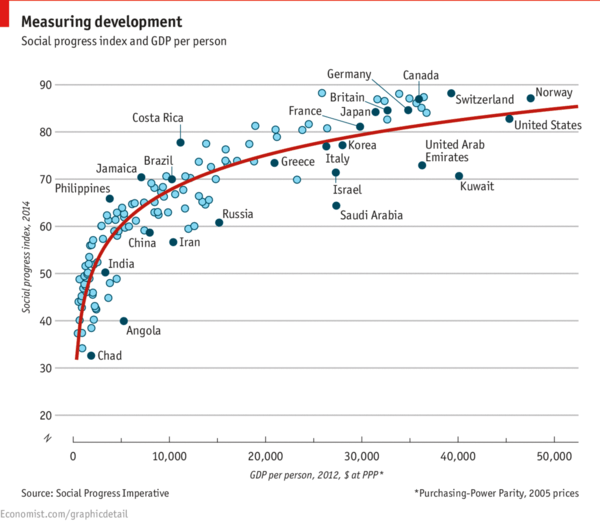 The Economist plotted SPI data against per capita GDP to see which countries are "punching above their weight" in terms of social progress. The chart reveals interesting insights about the effect or correlation of GDP on well-being in society. In general, the higher the per capita GDP, the higher the SPI. This is represented by the red line that plots the "average" curve. Countries above the red line are those where social progress indicators are better than per capita GDP would suggest. For example, Iran and Costa Rica have similar per capita GDP. However, Costa Rica performs significantly better than Iran on measures of social progress. Another example contrasts Brazil and UAE. Both are similar in their SPI scores even though UAE has a significantly higher GDP per person. In 2010, U.S. GDP was $14.59 trillion. In the same year, the GNP was $14.64 trillion. The numbers for the U.S. are not very divergent because U.S. income receipts and payments are roughly in balance. On the other hand, Ireland GDP in 2010 was $211.39 billion and GNP $149.54 billion.